Hi friends! I attended a demonstrator meeting last night and we had the best time, thanks Rolanda! We made the card that I will be sharing with you today! It's a Valentine's card and it's masculine, but I think you could change the colors if you didn't want it to masculine. I can see this done in pink/gray! Here's what the card looks like. We used the de-embossed side of the Honeycomb Embossing Folder, stamped our sentiment from Petite Pairs and punched using the Petite Curly Label punch that you can earn for FREE during SAB and punched a heart from the Red Glimmer Paper using the Full Heart punch. This is all layered onto a square of First Edition Specialty Designer Series Paper and layered on a square of Basic Black with just a touch of the new Two-Tone Basic Gray/Basic Black Ribbon. I really like the clean look of this card! 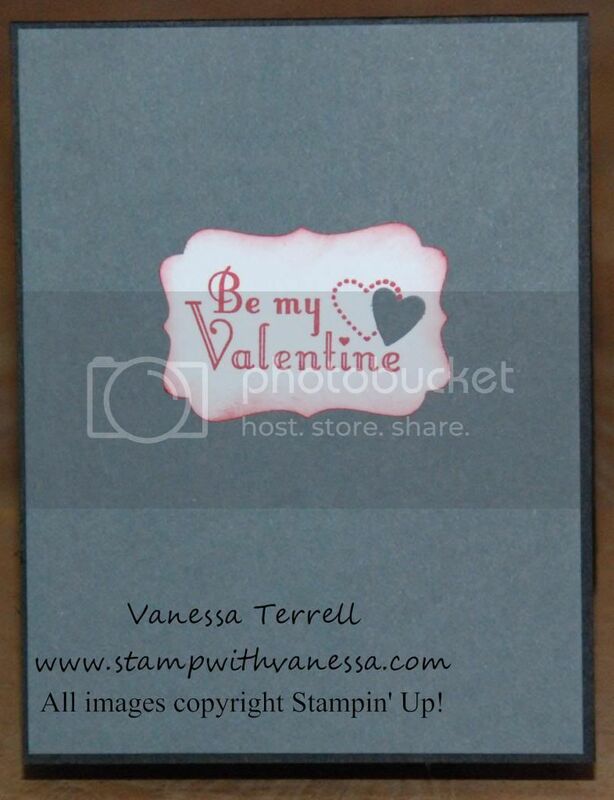 Stamped sentiment from Delightful Dozens and punched it out with the Decorative Label Punch and punched a heart from a retired punch, but you could used the Owl Builder Punch and I sponged on Real Red ink. You do great work. I really need to get back in to it when I have five minutes. Love the kiss one, gonna borrow that idea from you! Beautiful. I love home made card. I wish I do more of this! Great post! I have wanted to try something like this for years but time is so hard to find these days. Thanks for showing us your creative and wonderful work! Great card I love that heart that you made! Very nice! I love the glittery heart!